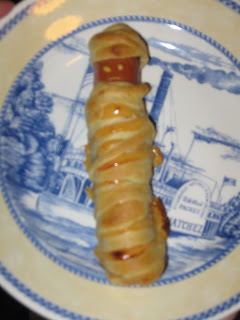 I decided to get into the whole Halloween spirit this year and make these fun and creative "Mummy Dogs" for dinner one night. They are SUPER easy! I got the ingredients SUPER cheap by using coupons and searching for a sale on hot dogs and crescent rolls. We probably fed a family of 4 on less than 3 dollars! I also made "spider" cupcakes but I couldn't find legs for the spiders and the boys devoured the cupcakes before I got a picture!